What’s So Great About an INFINITI Q50 Lease in Mandeville, LA? Are you looking to lease a new car? If you want to drive a luxury sedan on the roads of Mandeville, LA, few offers will rival an INFINITI Q50 lease. From performance and reliability to function and features, you’ll love what this vehicle brings to your everyday driving. Test-drive one today and get the additional benefits of a lease. Anyone who drives an INFINITI knows that these vehicles have few peers when it comes to comforts and conveniences. When you check out an INFINITI Q50 lease, you’ll see a host of appealing features that you’ll love in a new vehicle. The Q50 has keyless ignition as well as audio and cruise controls right on the leather and alloy steering wheel for your convenience. Everyone in the car will rave about the climate control, not to mention front seatback storage and overhead console. You’ll put the rearview camera to good use, and the dual illuminating mirrors will be a hit. You won’t have to worry about the seats in the Q50 cramping you as you drive and ride in Mandeville, LA. In the front, the leatherette bucket seats offer 39.5 inches of headroom, 56.7 inches of shoulder room, 44.5 inches of legroom, and 53.2 inches of hip room. The driver will have eight-power adjustments in the seat. In the back row, there’s a folding center armrest. The Sport model has a split-folding seatback. All rear passengers will have room to spread out, thanks to the 36.8 inches of headroom, 52.5 inches of hip room, 35.1 inches of legroom, and 56.1 inches of shoulder room. As you research the benefits of an INFINITI Q50 lease, you’ll love what you see in fuel economy. The LUXE version gets 23 combined miles per gallon, including 20 miles per gallon on city roads and 29 miles per gallon on the highway. It has a 20-gallon tank, so one fill-up will go a long way. You can drive 400 miles in the city and 480 miles on highways and freeways before you’ll have to stop at the pump for more fuel. Drive with peace of mind in Mandeville, LA, knowing your vehicle has a 3.0-liter, 24-valve, V6, DOHC engine. It generates 295 foot-pounds of torque at 1,600 rpm and 300 horsepower at 6,400 rpm. You don’t need to search all over Mandeville, LA, for an INFINITI Q50 lease. 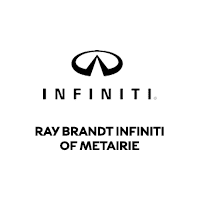 Simply come to Ray Brandt INFINITI today and see what options you have.